In April Saturn, a month past opposition, gives us wonderful views with its rings inclined about four degrees to us. It transits at 60 degrees up at about 10pm. Mercury moves away from the sun as April progresses, and into the evening sky, giving us our best view of 2009 by month’s end. All the other planets are morning objects this month: Jupiter and Neptune are far enough away from the sun to give us a decent look, while the others huddle together in the morning twilight. Venus gives a good morning show, though. The crescent moon will occult a bright, thin crescent Venus on the morning of April 22: Venus disappears under the moon’s sunlit side at 5:11 am and begins reappearing near the bottom of the crescent moon at 6:04. Sunrise on the 22nd is at 6:24. Mars, also in the morning, has brief close encounters with two other planets: Venus on the 18th and Uranus on the 15th. The Mars/Venus encounter really isn’t all that close – maybe they’ve been squabbling. The Uranus encounter is better, only half a degree, so let relatively bright Mars point the way to much dimmer Uranus, currently just a hair above sixth magnitude. And what about Pluto? The dim outer pl– er, whatever it is, rises a bit after midnight and is visible in the dawn hours. So what is Pluto? Maybe you caught the news last month that Illinois, birthplace of Clyde Tombaugh, has declared Pluto a planet. It joins New Mexico, Tombaugh’s longtime home, which made a similar declaration two years ago. When I first heard about the New Mexico resolution, I was told that they had declared that Pluto would be a planet within the state’s boundaries. 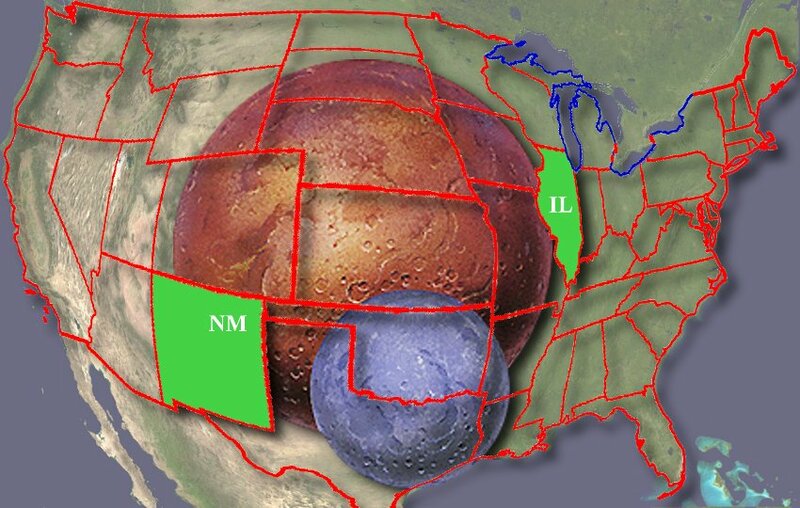 That made me a bit curious: would Pluto even fit inside New Mexico? I looked it up: Pluto has a diameter of 2300km, while New Mexico is about 550km in longitude and a bit more in latitude. Not even close (Figure 1). Too bad – I liked the image of Pluto coming to visit and hang out with friends. Though at Pluto’s orbital velocity (it takes it just under 248 years to complete its 18 billion kilometer orbit, meaning an average speed of 23 million km/year or 63,000 km/day) and its current distance of about 32 AU (4.8 billion km), it would take it about 207 years to get here. BE IT RESOLVED BY THE LEGISLATURE OF THE STATE OF NEW MEXICO that, as Pluto passes overhead through New Mexico’s excellent night skies, it be declared a planet and that March 13, 2007 be declared “Pluto Planet Day” at the legislature. RESOLVED, BY THE SENATE OF THE NINETY-SIXTH GENERAL ASSEMBLY OF THE STATE OF ILLINOIS, that as Pluto passes overhead through Illinois’ night skies, that it be reestablished with full planetary status, and that March 13, 2009 be declared “Pluto Day” in the State of Illinois in honor of the date its discovery was announced in 1930. So the law applies to anyone (though it’s probably not enforceable outside state boundaries) – but only when Pluto is overhead in New Mexico or Illinois. But wait – does Pluto ever actually pass overhead in those states? New Mexico stretches from 31.2 to about 37 degrees latitude, while Illinois spans 36.9 to 42.4. Right now Pluto is in Sagittarius, with a declination of -17 41’; there’s no way anyone in the US is going to see it directly overhead this year. Worse, it’s on its way even farther south. It won’t cross into the northern hemisphere until the beginning of 2111. But how far north will it go? My first thought was to add Pluto’s inclination – 17.15 degrees, very high compared to other planets – to the 23 degrees of the ecliptic to get 40.4°. Way far north – no problem in either state! But unfortunately it’s not as simple as that. It turns out that when Pluto gets to its maximum north inclination, it’s in Bootes (bet you didn’t know Bootes was a constellation of the zodiac, did you! It’s that 17° inclination that puts Pluto just past the Virgo border). That’ll happen in February of 2228. But in the Virgo/Bootes region, the ecliptic is 8° south of the equator, not 23° north. So we don’t get to add 23 and 17; in fact, Pluto’s declination will only be about 7.3° north. That’s no help! To find the time when Pluto gets as far north as it’s going to get, you have to combine the declination of the ecliptic and the angle of Pluto above the ecliptic. The online JPL HORIZONS simulator is very helpful for running data like that over long periods – much easier than plugging dates into a planetarium program. HORIZONS told me that Pluto’s maximum northern declination, 23.5°, will happen in spring of 2193. Unfortunately, 23.5° isn’t far enough north to be overhead even from Las Cruces, NM. So Pluto, sadly, will never be overhead from either New Mexico or Illinois, and thus by the text of the two measures, it will never be a planet. With that in mind, I’m asking you to support my campaign to persuade the governments of Ecuador and Hawaii to pass resolutions similar to the New Mexico and Illinois ones. Please give generously – and hurry, because we need your support before April 1!